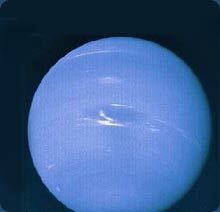 Neptune is the eighth planet from the Sun, located in between Uranus and Pluto. The distance between Neptune and the Sun averages almost 2.8 billion miles. Neptune completes an orbit around the Sun just once every 165 Earth years, but the planet rotates approximately every 16 hours. It is a stormy blue planet with a molten rock core. Around the core is a layer of very cold water, which moves gradually into a top layer which is made of hydrogen, helium, and a small amount of methane. This methane gives the planet its blue color. Like the other gas planets, Neptune has rings. Neptune’s rings are made of small, dark clumps of rock. 8 known moons surround the planet. The largest moon is Triton, which has nitrogen “geysers” that erupt on its surface.